The Russian military has unveiled an unmanned aerial vehicle (UAV) which can carry anti-tank rocket launchers and flamethrowers; it can also fly on reconnaissance missions, transport cargo and coordinate artillery fire on the battlefield. The drone was developed by the United Instrument Manufacturing Corporation (UIMC), a subsidiary of the civil and military technology firm Russian Technologies State Corporation (Rostec). 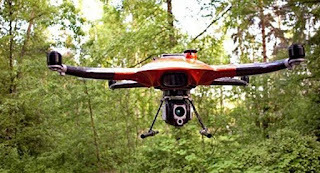 "The drone determines the coordinates of a location using GLONASS satellite signals and can correct artillery fire. The combat multicopter is able to find enemy objects such as tanks and armored vehicles and destroy them with rockets," UIMC explained. "It is capable of carrying out reconnaissance and monitoring, patrolling closed and open spaces, transporting cargo, preparing cartographic material and also conducting military operations," UIMC general director Sergey Skokov told RIA Novosti. "The human role in the management of the robots has been minimized. The squadron of drones is capable of working autonomously, as each machine independently fulfils its function and precisely follows a specified route," Skokov said.